What are they?Why are they important? Aboriginal people tended the Garry oak ecosystems, using fire and cultivation as management tools. The edible bulbs of camas and other species were the focus of the plant harvest. So important were these plants that the Victoria area was originally known as Camosun, or "place to gather camas." The European explorers and settlers were attracted to the aesthetic qualities of the oak landscape. Superlatives from Captain George Vancouver include "as enchantingly beautiful as the most elegantly finished pleasure ground in Europe." The oak landscape has continued to be important for aesthetics and as a contribution both to the sense of place and to the regional identity of Victorians. Emily Carr, esteemed west coast artist, grew up in the Garry oak meadow, and described our Easter lilies as "the most delicately lovely of all flowers," and "in all your thinkings you could picture nothing more beautiful than our lily field." Some feel that Garry oak groves should be preserved to "serve the whole community's spiritual needs, as well as for themselves and the spirit they embody." There is fond local appreciation of the spectacular wildflower shows that the meadows exhibit. Successive waves, in a palette of blue, mauve, white, and gold, rush through their spring presentation over a three or four month flowering period. The value to society of the Garry oak landscape is now being recognized. Victoria City Council adopted a resolution recognizing the historic and ecological significance of the Garry oak ecosystem. Garry oak has been referred to as "our foundation native species." Garry oak will be included in the tree preservation bylaws being developed by several municipal councils. The plight of the ecosystem has been featured in a number of local and national level media stories. Several local development proposals have been opposed by those wishing to save Garry oak landscapes. A colloquium focusing on Garry oak ecosystems, the first of its kind, was held in Victoria in 1993. Three have been held since reflecting increasing concerns over the growing threats to the survival of Garry oak ecosystems. The Victoria area has a high concentration of rare species when compared to the rest of the province. Garry oak ecosystems have been identified as a "hot spot" of biological diversity. In addition to the rarities they contain, the designation reflects their limited extent, the significance of their biodiversity from a provincial perspective, and the trend of accelerating habitat loss. Our position at the northern margin of the Californian flora results in a range of species that is one of the most interesting in Canada. Attractive, but now rare, plant species such as Howell's triteleia, golden paintbrush, deltoid balsamroot, and dozens of others highlight the importance of this biotic zone. Birds are affected too. Lewis' Woodpecker, once a resident of the open, dry woodlands of southern Vancouver Island, disappeared early in the 20th century. Concern is growing for the conservation of a number of other birds for which the ecosystem provides habitat, such as Cooper's Hawk, Western Bluebird, and Band-tailed Pigeon. 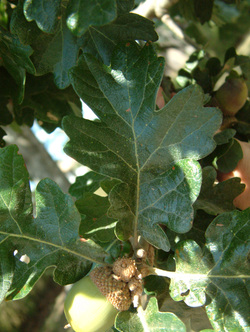 Nest holes, acorns, and open country habitat are among the attractions which the oak woodlands provide. The rare, little-known, sharp-tailed snake also inhabit this ecosystem. Many invertebrates, including robber flies, butterflies, and seed bugs are restricted to these sunny, coastal meadows. A subspecies of large marbled butterfly is extinct; the perdiccas checkerspot butterfly is no longer found in British Columbia, and Taylor's checkerspot has been reduced to two populations, one of which is on Hornby Island. The propertius dusky wing butterfly is completely dependent on Garry oak for larval growth and is considered a vulnerable species. What is their present status? They are going fast. Very little of the original Garry oak landscape remains in an unaltered state. They have declined dramatically in extent over the past two decades, and much of what remains has been strongly modified. There is growing public and scientific concern about preservation of the Garry oak ecosystem. One of several recognized Garry oak vegetation types, the Garry oak - grass community, has been rated as one of the most endangered in British Columbia; other types are rated as threatened. Garry oak ecosystems are the most diverse terrestrial ecosystems in British Columbia, containing species ranked "at risk" to loss or serious depletion. Garry oak ecosystems range from southwestern British Columbia to California. These ecosystems occur within a distinctive climatic zone: a near Mediterranean climate, shaped by rainshadow of the mountains to the southwest. This is a region of moderate climate, with dry summers. In British Columbia, Garry oak ecosystems occur only on southeastern Vancouver Island and adjacent Gulf Islands, plus two isolated groves east of Vancouver. The Garry oak landscape includes a mosaic of woodlands, meadows, grasslands, scattered Douglas fir stands, and open rocky areas. Irregularly wooded landscapes are called "parklands." The term "meadows" describes the open areas, particularly appropriate in spring and summer when they are lush with bright wildflowers: blue camas, white Easter lily, and yellow western buttercup. Other fascinating species are satin flower, chocolate lily, and little monkeyflower. Parts of the landscape also feature shrub stands of snowberry and ocean spray. Rock outcrops support scattered shrubby oaks, along with licorice fern, rock mosses, and grasses such as Idaho fescue and California oatgrass. These grasses evoke an image of the southern origin of the Garry oak ecosystems.